OSTEOPOROSIS: CAN IT HAPPEN TO YOU? LAB PICSOsteoporosis is a major health threat for over 44 million Americans. Ten million already have osteoporosis and 34 million have low bone mass placing them at increased risk for developing osteoporosis and the fractures it causes. Eighty percent of those affected by osteoporosis are women. Known as “the silent thief” osteoporosis progresses without symptoms or pain until bones start to break, generally in the hip, spine and wrist. 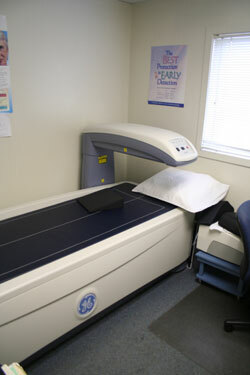 Gettysburg Family Practice offers Bone Density Testing (DEXA), which is a 10-15 minute scan that is easy, quick and painless. A bone density test uses X-rays to measure how many grams of calcium and other bone minerals are packed into a segment of bone. A bone density test is a fairly accurate predictor of your risk of fracture. Gettysburg Family Practice also offers the Achilles Heel ultrasound testing which is another screening test for osteoporosis. The Achilles measures the bone density of the heel. The heel is used because its structure provides measurements comparable to DEXA measurements of the hip and spine. Using high frequency sound waves, the Achilles measures both the speed of sound and broadband ultrasound attenuation thus analyzing the density of the bone by measuring both how fast sound travels through it, and how much of the sound reaches the other side. Ask your provider about these tests and learn what your T-Score is!